Since it started in March 2012, 450 records have been uploaded to the BOP section of the Virtual Museum. BOP stands for Birds with Odd Plumage. The BOP logo conveys the concept of “odd plumage”. This blog reviews a few of the records in BOP. The Virtual Museum website describes BOP this way: “Birds with all sorts of unusual plumage variations are observed from time to time. Nowadays, with digital photography, pictures of these birds are frequently available. 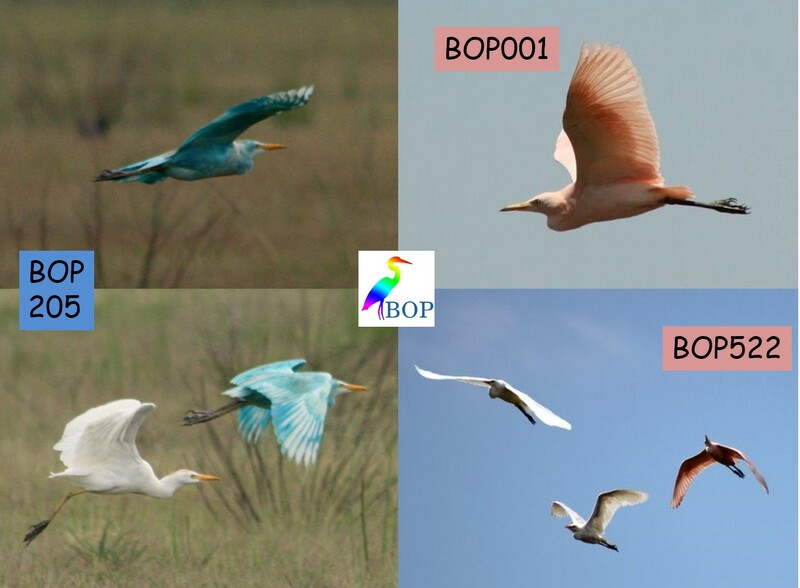 BOP (Birds with Odd Plumage) aims to provide a place where the photographs can be curated into one database. Any bird with any unusual plumage characteristic qualifies for inclusion in the Virtual Museum. This will provide the opportunity to look for patterns. Do certain species have abnormal plumage more frequently than others? Do unusual plumage patterns occur more in some places than in others?” The BOP section of the Virtual Museum has also become a curation place for photos of birds with deformities, especially of the bill, and also of hybrids. 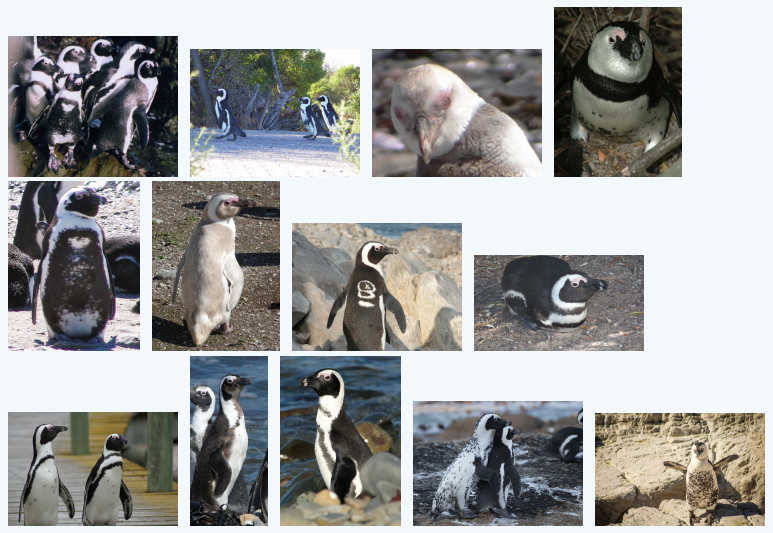 Here is a collage of thumbnails of the 13 African Penguins Spheniscus demersus uploaded to BOP. The most commonly encountered plumage abnormality is a double throat band, similar to that of Magellanic Penguin Spheniscus magellanicus. Every year there are twitchers who believe they have made the first African record of the Magellanic Penguin. But take a good look at the two photos of penguins at the left ends of the first and second rows. They are both more or less black in front, and they have white patches in the same places. They look like photos of the same penguin. Here they are, side by side! 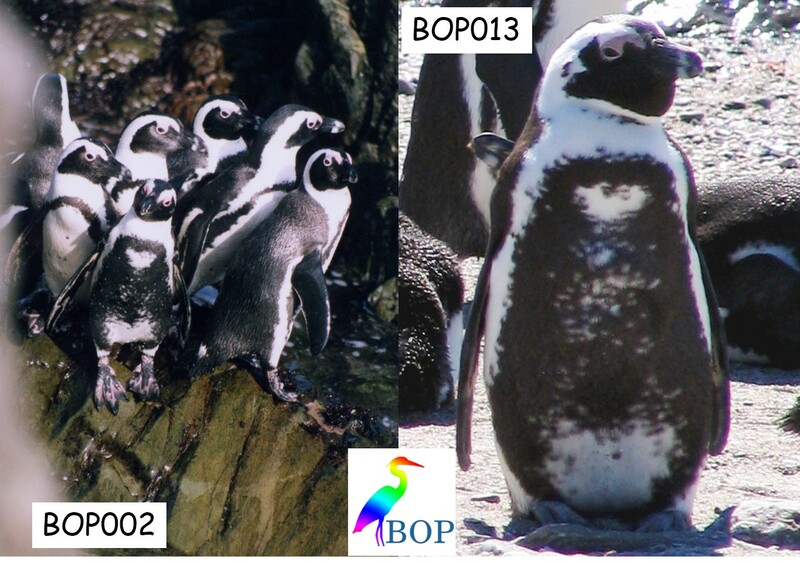 The left photo, BOP002, was taken on Robben Island on 21 May 2004 (curated at http://vmus.adu.org.za/?vm=BOP-2). The right photo, BOP013, was taken by Jessica Kemper on Halifax Island, Namibia, on 1 June 2008 (curated at http://vmus.adu.org.za/?vm=BOP-13). 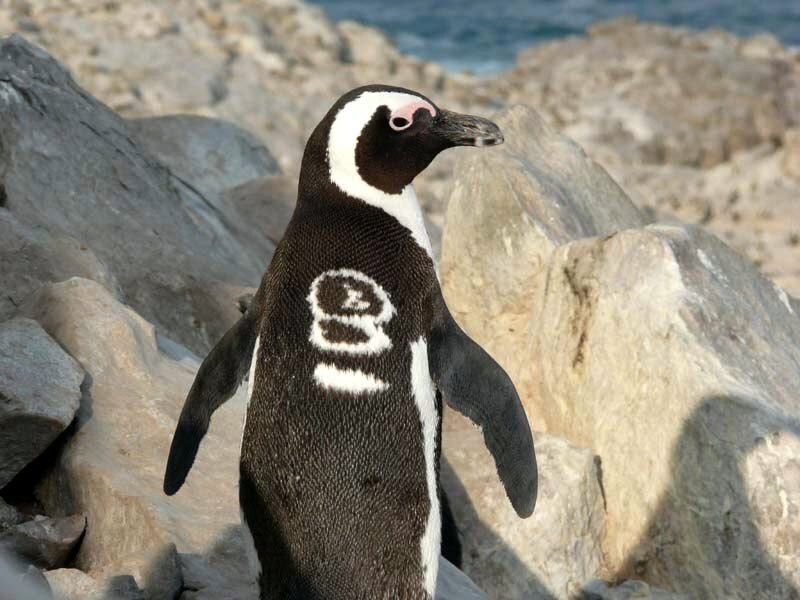 Movements of African Penguins between the the Namibian islands and the penguin colonies of the Western Cape have been recorded, but are quite unusual. Alas, we do not have a match. Jessica and I have agreed that, even though the general patterns of these two birds are quite similar, the details are very different. For example, the penguin on the right has a small throatband, the one on the left does not (the patterns stay identical moult after moult). 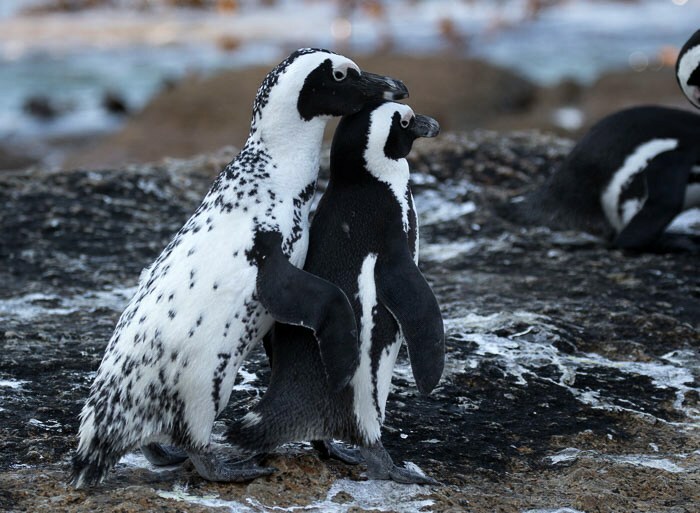 Nevertheless, it is amazing that essentially the same colour morph, the “black-fronted African Penguin” has occurred in two colonies so far apart. There are two more African Penguins with extremely odd plumages. And this “Dalmation”-style penguin was photographed in the penguin colony at The Boulders, in Simonstown, by Andre Coetzer on 17 February 2017. The white back would be a useful climate change adaptation, because the normal black back is a poor choice of colour when lying on nests incubating eggs. Black absorbs heat, white reflects it. (See http://vmus.adu.org.za/?vm=BOP-290). The next case study is totally different to the records for all the other species in BOP. We do not for a moment believe that the feathers of the Cattle Egrets actually grew to be pink and blue, just like we don’t believe that the blue ones are boys and the pink ones are girls. We have absolutely no idea what happened to dye these Cattle Egrets blue or pink. They were solitary coloured birds in flocks. The blue egret on the left was photographed by Grant Egen at Mkombo Dam, Mpumalanga, on 18 January 2015 (see http://vmus.adu.org.za/?vm=BOP-205). The photographs on the right were taken by Suzanne van Maltitz on a farm in the Northern Cape just south of Spitskop Dam. The top photo was taken on 22 January 2012, and the bottom photo three years later on 13 February 2015 (see http://vmus.adu.org.za/?vm=BOP-1 and http://vmus.adu.org.za/?vm=BOP-522). Explanations welcome. This bizarre abnormality is fairly frequent! 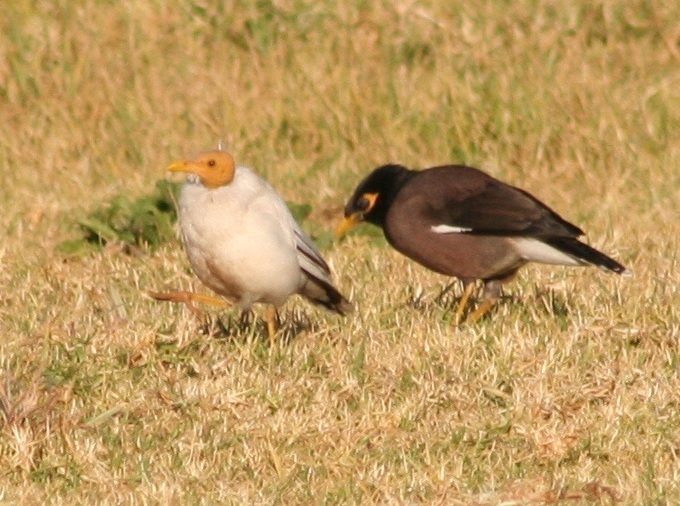 It’s a bald Common Myna, featherless head, and a bright yellow skin, simply known as a “bald-headed myna”. They are sometimes also referred to as “King Mynas”, as in this blog from the Seychelles where there is another, almost identical, photograph. 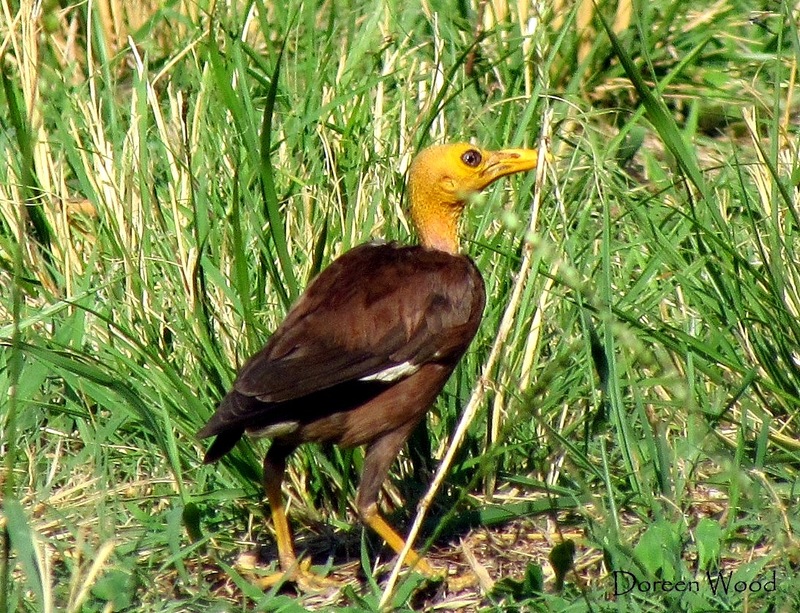 Wherever Common Mynas occur, both in their native range and also in the multiple areas where they have been introduced, bald-headed mynas are observed occasionally. Chris Feare, co-author of a book called Starlings and Mynas, is particularly interested in this abnormality. He says: “It is remarkable that such an obvious and widespread variant has received little mention in myna literature. The causation of this strange condition remains pure speculation. We are not even close to understanding what is going on with bald-headed mynas.” Chris was involved in a myna eradication campaign in the Seychelles. “We don’t have enough data to uncover any seasonal effects, and we killed all the birds we caught during eradication programmes so we can’t say whether they remain in the condition for life, or recover a full head of feathers at some stage.” So here is a challenge for everyone who lives with mynas. If you have a bald-headed myna in your neighbourhood, try to watch it, and see if the baldness is permanent, or whether it sprouts new feathers after a few weeks or months! The photo above, by Doreen Wood, was submitted by Grant Egen, and is curated at http://vmus.adu.org.za/?vm=BOP-181. It can’t get much worse than this for a myna. Johan van Rensburg took this photo west of Delmas in Mpumalanga on 18 May 2014. He comments: “A rather bizarre combination of two rare, unrelated plumage conditions, bald-headed as well as leucistic. One in a million?” Curated at http://vmus.adu.org.za/?vm=BOP-157. 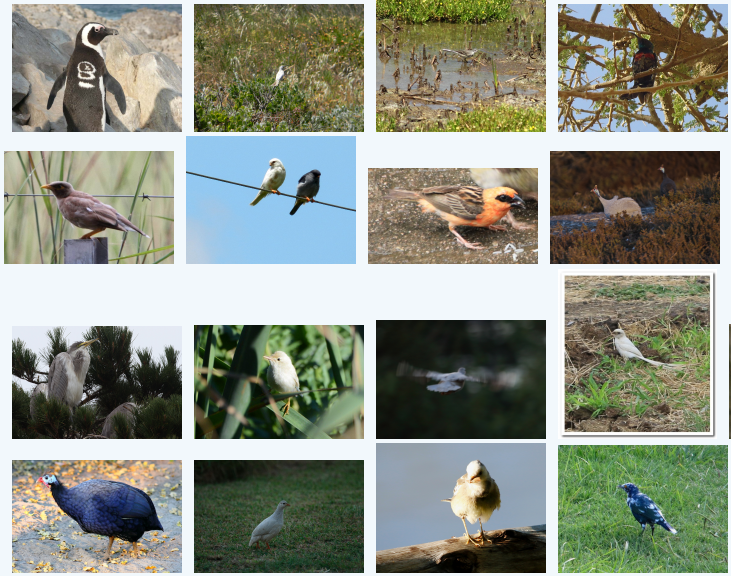 If you want to have a look at more of the weird and wonderful plumages uploaded by citizen scientists, and curated in Birds with Odd Plumage, head over to the Virtual Museum at http://vmus.adu.org.za. Select BOP as your project, and then click on either of the “Search” buttons without choosing anything specific to search for. The next page will display the first 30 records. At the top of this page, you can click on “Display thumb-nails only”, and you will get small versions of the first 250 records in BOP. Click on any of the thumb-nails, and you will get a display of the record. 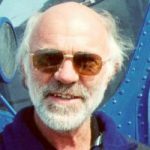 If you have photos to contribute to BOP, please do upload them! If you are new to the Virtual Museum, and want to get involved, please make contact.